This post contains press samples (#gifted items) and affiliate links. Please click here for my disclosure policy. Thank the lord: something completely new and interesting and potentially life-changing in the world of makeup. Actually not that new, because the Trinny London range has been out for a while now (always late to the party, me) but definitely very interesting and I’m not exaggerating about the life-changing part. At least for those of you who don’t use makeup brushes and like to swoosh everything on, finger-painting style, with minimum fuss. The range has been designed specifically to be applied with fingertips, so all of the products are cream-based. Which makes total sense. If you’ve ever tried to blend out overdone powder eyeshadow with your fingertips then you’ll know what I mean. Cream products melt slightly with the heat from your fingers which makes them the perfect consistency for blending – they then set nicely, if they’re well formulated, and have the freshest, loveliest finish. And these are well-formulated. Everything from the foundation to the cream eyeshadow feels luxurious, highly-pigmented and easy to work with and the finishes have that lovely sheeny, sheer quality that so many cream products lack. 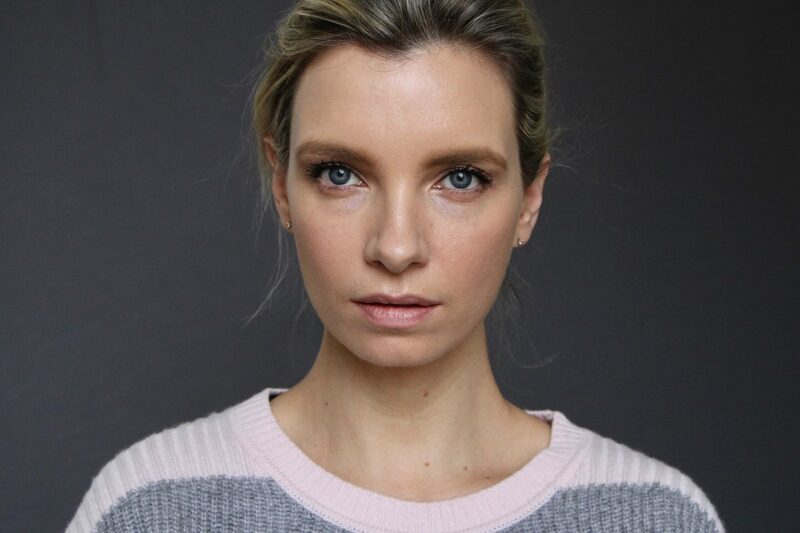 It’s grown-up makeup for people who just want to add a hint of a flush here, a little coverage there – it’s not glitter-laden lip-glosses and stencil-on brows. The shades, too, are really sophisticated and neutral. As you search through the website it can all feel quite repetitive – three or four eyeshadows with similar tones, a blush that looks the same as a bronzer that looks the same as a lip balm – but it’s these small variations that are the genius of the whole affair. It means that you can find the shades that exactly flatter your skin and hair tone – and that you get the right consistency to perform well on whatever part of your face you’re using it. A cream eyeshadow has different demands put on it than a cream lip colour, for example – both are creams, but the texture needs to stand up to use. So anyway, all positive here; I love a cream shadow, I adore a cream blush, lipsticks are cream anyway whether they’re stuck into a tube or kept in a little jar. The fact that the entire range is cream-formulated pleases me; it’s something a bit brave and new. Brave because it won’t be for everyone (lots of people can’t stand applying makeup without brushes, some balk at the fingers-in-pots aspect) but for those who do like to swipe things on without a mirror, in the dark, in the back of a cab, it’s a one-stop-shop. The portability of these products is also a bit of a boon; easy to slip into hand luggage or handbag, the pots push together to form stacks (though I do think this makes it difficult to instantly find what you need to find) and everything is really lightweight. I think it would be great if the shades and products types were written on the sides of the pots so that you could identify things whilst they were still stacked (the names at the moment are on the bottom) but apart from that, it’s a great concept. My best buys? 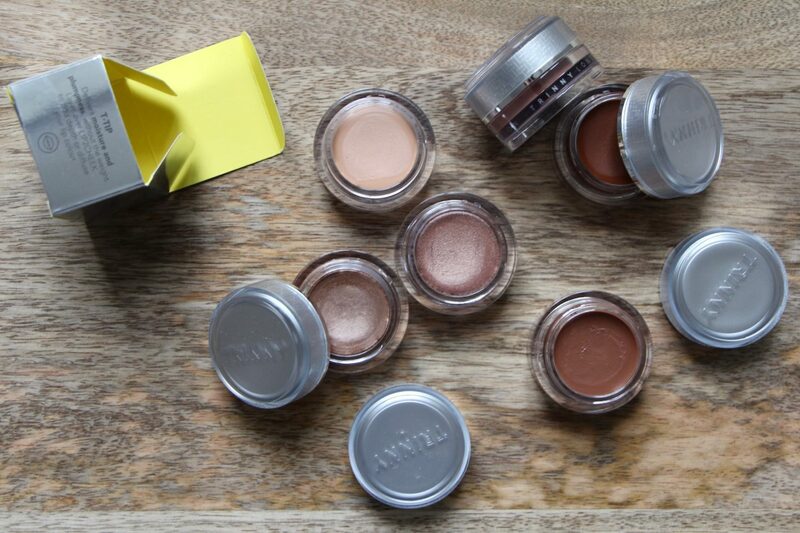 The cream eyeshadows and the cream blush and – surprisingly – the foundation/concealer, which is called Just a Touch. It’s just about heavy enough to knock back dark circles, if you build it up a bit, but has the distinct advantage of being light enough to blend outwards with fingertips to form a rudimentary, “just where you need it” sort of base. Here I’m wearing the foundation as a concealer (I was doing some test pictures with the new Dior Forever foundation before this, so I must declare the fact I’m wearing a full-coverage base to start with! 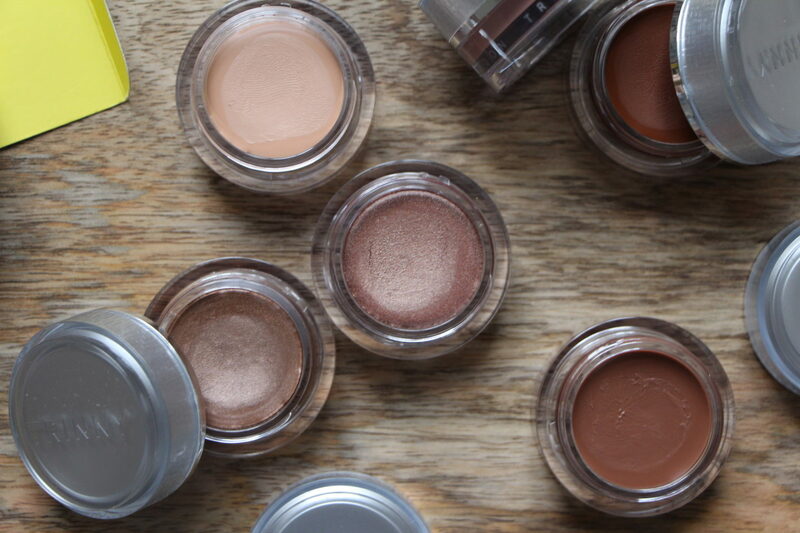 ), two different Eye-to-Eye shadows (Wisdom and Electra ), a cream bronzer and the cream blush in Electra. I also used the blush as a top coat to my lips and it had a lovely milkshakey quality to it that pleased me greatly. It’s slightly too matte for a lip thing (there is a dual-purpose lip and cheek tint if you want to cover both bases) but I like to have a play about. The cream blush lasted all day, the shadows did immensely well and I actually applied powder shadow over the top for a night out, so that the cream shadows formed a kind of base. It worked rather well! The only thing I find quite difficult to work with fingertips is cream bronzer – I just struggle with placement and the sheer area that needs covering for it to give that beautiful, overall-sunkissed effect. But maybe I’m a div – plenty of people get on marvellously with cream bronze. 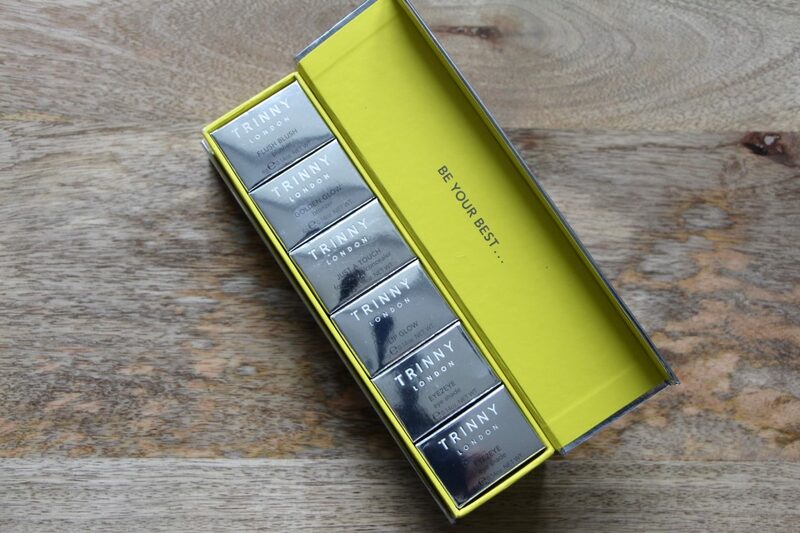 You can find the Trinny London range online here – I also spent a glorious (and hilarious) hour with Trinny Woodall herself in the back of her Trinny Taxi last year. And someone filmed it. If you’d like to watch that (includes a four minute makeup challenge) then you can do so here. Can you please review BFF as well? I think this is a brand that I am going to have to try out for myself soon! I love in Los Angeles, Ca and would love to purchase some CO-LAB dry shampoo but I can’t find it anywhere. Will you be expanding distribution to the U.S. soon? I love your wonderfully helpful YouTube channel. I do hope you’ll continue testing products and giving us your thoughts, your recommendations are invaluable to a novice such as me. Big fan. The primer is excellent. Have been intrigued by this range for a while and was excited to see your review. Just wondering what the shade are you in the just a touch foundation ? I have been searching for a replacement for the discontinued AERIN Multi-Color For Lips & Cheeks. How does Trinny’s cream blush compare? Would you recommend it as a very good sub? And if so, which shade comes closest to AERIN’s natural shade?